Vermont author Kimberly Harrington writes about the intersection of parenthood, work and social media in her new memoir. In the essay, Harrington quips, "What day is Mother's Day again? A Sunday? You mean a day everyone else has off anyway? Of course. Perfect." And she notes other things that get a day of national recognition: bobbleheads, cellophane tape, beer-can appreciation and personal-trainer awareness, to name a few. Kind of puts motherhood in perspective. 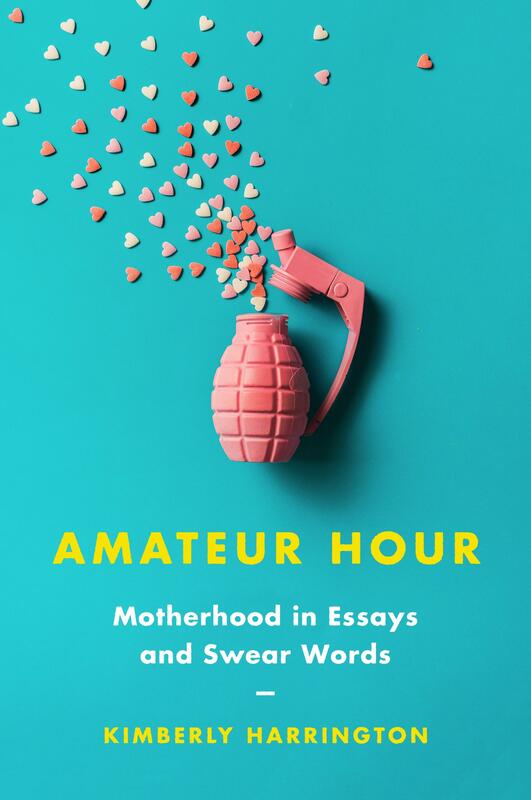 Harrington's snarky asides in her new memoir Amateur Hour: Motherhood in Essays and Swear Words come in groups, contained in their own chapters called Time Outs. Her humor is biting, cynical and laugh-0ut-loud funny. And those who know her writing from McSweeney's Internet Tendency or the New Yorker will find themselves in familiar territory. But these fictional lists and "bonkers conceptual pieces," as she puts it, are in stark contrast to how vulnerable and open she is about her experience of motherhood in other chapters. Harrington begins the book with a note to her children, 13-year-old Walker and 11-year-old Hawthorne. "Thank you for going away so I could write about how much I love you," the dedication reads. Harrington, who also works as a copywriter and creative director, had seven weeks to write the book last summer. "I was constantly avoiding them and making them avoid me," she told Vermont Edition, "and then crying about them with my laptop in front of me all summer!" And the book reads, in many ways, as a love letter to them. "Any writer, on some level, wants to do something permanent, that's going to outlast them," she says. "I do think [the book] was my space to really be able to have these loving conversations with them, almost. Even if right now those conversations are extremely one-way. But I hope they'll appreciate those at some point." Many of Harrington's personal essays in Amateur Hour are reflections on her own life, stretching back to her years before marriage and children. She writes about the pressure of work and family, and of how one's own personal identity can both conflict with and get wrapped up in the parenting process. In Harrington's case, she wonders about her desire for "likes" and "hearts" on social media and contrasts that with her husband's complete aversion to social media. By way of example, she reveals in one essay that the first time she texted her husband the thumbs up emoji he wrote back "that's not nice" because he thought she was saying "up yours." When it comes to her kids, Harrington says the desire to share their adorable moments has come into conflict with their emerging autonomous identities. But that doesn't mean she gave them veto power over what she wrote in the book. "Nope. I sure did not," she laughs. In fact, they haven't yet read the book. Walker, her older son, has little interest in the book. But her daughter, Hawthorne, has wanted to read every page from the moment she knew the book existed. Harrington says there are some essays she hopes they'll never read, things "they can't unsee once they've read them." She's considering taking the advice of a friend to cut pages out of the book with a box cutter and give essays to Hawthorne over time, as she's ready. "It's sounds really tantalizing when you're not allowed to read something," she's tried to explain to her daughter, but "the vast majority of the stuff in here, certainly from a humor standpoint, is old lady humor. It's parenthood and it's marriage and it's just stuff that is not going to have her bringing it to middle school and being like, 'Hey, guys, look what my mom wrote; it's amazing!'" Nonetheless, Harrington is pleased with the book, and what she has produced captures a moment in time, encapsulating the craziness of marriage and parenthood and being a working mother in 2018. "I feel comfortable with everything that's in here," she says. "I've really had time to examine it. I think it would be a very different book if I wrote it when they were younger. And I think it would be a very different book if I wrote it three years from now. I find it really fascinating in terms of my changing relationship with them." Listen to the full interview above for more with Kimberly Harrington. Broadcast on Thursday, May 3, 2018 at noon; rebroadcast at 7 p.m.
With the 17 people who lost their lives when a gunman opened fire at a high school in Parkland, Florida, last week are still very much on the minds of Americans a two-year-old essay by Burlington writer Kimberly Harrington has renewed resonance. It's a centuries-old tradition with a wild history and deep New England roots. We're talking about American country dancing, including contra dance. We'll hear from the author of a book that traces the story of this tradition, and we'll talk about how and why it still appeals to so many people today.